McDonald’s Discount – Bracelets for 9,99€! Buying a Happy Meal in McDonald’s, you will get a discount flyer so you can come to Pola Park for only 9,99€. The flyer is only valid for one person, not combinable with other offers and you must check the conditions on it. Available in CC L’Aljub, Altabix, Carrús and Santa Pola. Have you visit Pola Park and you want more? 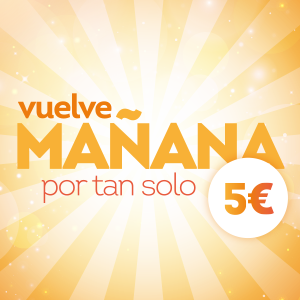 Come back tomorrow for only 5€! Valid only to come the day following the purchase. You must bring your purchase ticket and keep the bracelet on your wrist. Promotion compatible with any sell point. Discount in Torrevieja.com – Bracelets for 9,99€! 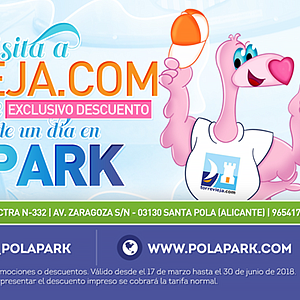 Visit Torrevieja.com to get a discount flyer so you can come to Pola Park for only 9,99€. The flyer is valid only for one person, not combinable with other offers and you must check the conditions of it. The flyer must be printed. Get it on the website.